Reference number for this case: 30-sep-54-Jouy. Thank you for including this reference number in any correspondence with me regarding this case. be. They have been observed for more than one hour. LA ROCHELLE, 6. -- Mr. and Mrs. Guillemoteau were in front of their farm when they saw, about a meter from the ground, a spherical saucer that could have measured 2 to 3 meters in height and of a diameter of 5 meters. The craft, which produced no noise, stopped a few minutes, then went up vertically. Mr. Guillemoteau the next day, went to the place where he had seen the craft and could find oily traces on the grass. MELUN, 6. 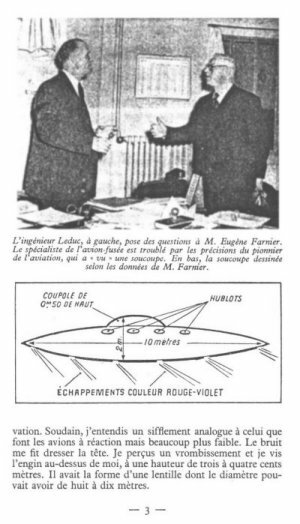 - Coulommiers newspaper "Le Pays Briard", published a letter from one of his readers, Mr. E. Farnier, Member of the Society of Civil Engineers of France, about a flying saucer. In this letter, Mr. Farnier says he has seen over his property in Jouy-sur-Morin, a large disk of 8 to 10 meters in diameter "turning on the spot while releasing red-violet light, with a whistling sound somewhat reminiscent of the arrival of a jet plane. The craft was about 400 meters in height and hovered over twenty minutes above me. So I, said Mr. Farnier, had all the time to observe it. The craft then disappeared towards Coulommiers." "Former commissioner of the Aero Club of France, having served in aviation, I have not been hallucinating and this thing was not a weather balloon, but a thick circular wing hovering on up and moving at very high speed gradually taking height." MANTUA, 6. - Traffic was interrupted for more than an hour in the center of Mantua by groups of people gathered to observe a strange "black object" which, at a high altitude, stood out clearly on the blue sky background. After making extremely rapid maneuvers, the spherical shaped craft - and according to some witnesses, it was part of "a formation of flying saucers" - remained for some time motionless in the sky before disappearing at the horizon. On the other hand the "Martians" also seem to want to visit Italy. Indeed, a fisherman of Roverbella, province of Mantova, said he was approached last night by a "mysterious person", dressed in red, who would have told him "unintelligible words" and who would have quickly left before the fisherman had time to call his wife. Mr. E. Farnier, member of the company of the civil engineers of France, about a flying saucer, just sent a letter to one of our colleague newspaper, in which he specifies that he saw above his property in Jouy-sur-Morin, a large disc from 8 to 10 meters in diameter, rotating on the spot while letting escape red-violet gleams with a whistling sound reminding a little of the arrival of a jet. "The machine was at a height of approximately 400 meters and hovered more than twenty minutes above me. I thus had, says Mr. Farnier, the time to examine it well." The machine disappeared then in direction of Coulommiers. In his letter, Mr. Farnier specifies: "Former chief at the Flying-club of France, having served in the aviation, I was not victim of a hallucination and this craft was not a weather balloon, but a circular thick wing hovering motionless and moving at a very high speed while gradually taking altitude." A Parisian weekly magazine has just published a really disconcerting testimony. 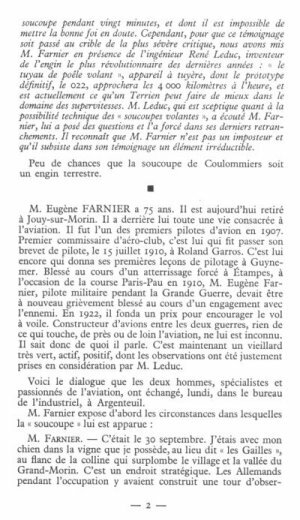 That of Mr. Eugene Farnier, one of the pioneers of aviation, former pilot and airplanes manufacturer, who was the flight instructor of Roland Garros and Guynemer. 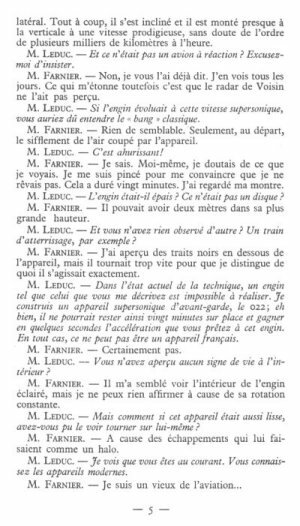 Mr. Farnier had a long discussion with engineer Leduc, the father of the fastest airplane of the world, who was deeply disturbed by the statement of his interlocutor. Last 30 September, Mr. Farnier observed during twenty minutes a flying saucer which was slightly swinging within 300 meters above his property of Jouy-sur-Morin. Many witnesses confirmed this appearance and the question was even mentioned in front of the city council of the place. Before raising in the airs at very high speed, the machine rocked on itself, showing its profile to the observer who made a sketch of it. This sketch strangely resembles that of an alleged cigar which a customs officer of Marignane saw landed with at 100 meters in front of him, on the airfield, in October 1952. The simplicity of this customs officer and competences of Mr. Farnier militate in favor of their testimonies. Will we finally see through this clearly? One will notice the submarine style of the two meters high, ten meters long saucer, with the bottom striped of black features. Observed by Mr. Farnier, former pilot whose report puzzled the celebrated engineer Leduc. Is it a new weapon? This brief booklet is only intended to demonstrate for the general public the reality of the existence of the Flying saucers. It confirms its description that I verbally made on October 9 on Jean Nohain and André Leclerc's show on Radio Luxembourg, on October 23 at the Club du Faubourg and tomorrow on the Television. 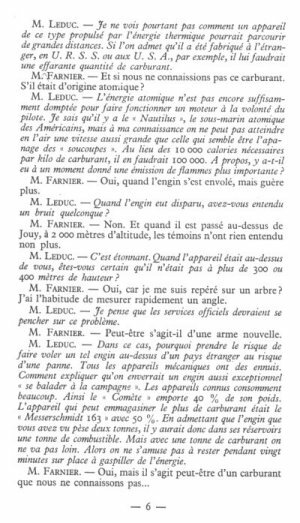 My words could not have been better than in the article France-Dimanche, #425, of October 17, 1954 and my dialogue with the Authority of the Doctor of the University of Paris, engineer René Leduc, the air speed ace. The opinion of engineer Leduc, rocket-plane specialist. saucer during twenty minutes, and it is impossible to question his good faith. However, so get this testimony screened by most severe criticism, we put Mr. Farnier in the presence of engineer René Leduc, inventor of the most revolutionary machine of these last years: "the flying pipe," an aircraft whose final prototype, the 022 , will get close to the 4000 kilometers per hour speed, and constitutes the best an earthman can produce in the field of superspeeds. Mr. Leduc, who is skeptic as for the technical possibility of the "flying saucers," listened to Mr. Farnier, asked him questions and forced him in his last resorts. He recognizes that Mr. Farnier is not an impostor and that there remains an irreducible element in his testimony. Little chance that the saucer of Coulommiers is a terrestrial machine. Mr. Eugène FARNIER is 75. Nowadays he is retired in Jouy-sur-Morin. He has a whole life devoted to aviation behind him. He was one of the first pilots of a plane in 1907. First commissioner of a flying-club, he is the one who tested Roland Garros for his pilot licence, on July 15, 1910. It is him again who gave the first piloting lessons Guynemer. Wounded during an emergency landing in Etampes, at the time of the Paris-Pau race in 1910, Mr. Eugene Farnier, military pilot during the great war, was to be seriously wounded again during a dogfight with the enemy. In 1922, he founded a price to promote gliding. Manufacturer of planes between the two wars, nothing that relates to aviation by far or near is unknown for him. He thus knows what he speaks of. He is now an old man, very dynamic, active, positive, whose observations were precisely taken into account by Mr. Leduc. Here is the conversation that the two men, specialists and impassioned with aviation, exchanged Monday in the office of the industrialist, in Argenteuil. Mr. FARNIER. -- It was on September 30. I was with my dog in the vine which I have at the location called "Gailles" to the side of the hill which overhangs the village and the valley of Grand-Morin. It is a strategic place. The Germans had built an observation tower there during the occupation. Engineer Leduc, on the left, asks questions to Mr. Eugene Farnier. The rocket specialist is puzzled by the precise details from aviation pioneer who "saw" a saucer. Underneath, the saucer drawn according Mr. Farnier's data. Suddenly, I heard a whistling sound similar to that of jet airplanes but much weaker. The noise had me look up. I perceived a humming and I saw the machine above me, at a height from three to four hundred meters. It had the shape of a lens whose diameter may have been of ten meters. Mr. LEDUC. -- You heard a humming, but the craft did not rotate? Mr. FARNIER. -- Indeed it was rotating, at a hundred tour per minute approximately, but still too quickly so that I could not see the port-holes with which it seemed equipped with at its top part. I saw this part, topped by a 50 centimeters cupola, only at the time when the craft flew away. Mr. LEDUC. -- Was the weather fine? Mr. FARNIER. -- Yes, the sky was very clear. There were no clouds. it was 05:20 p.m..
Mr. LEDUC. -- So the craft was hovering motionless? Mr. FARNIER. -- Yes, as if it were observing or as if aerial photographs were being taken. Mr. LEDUC. -- What color was the craft? Mr. FARNIER. -- Shining grey as if it was made of aluminum. Mr. LEDUC. -- Did you observe smoke? Mr. FARNIER. -- Yes, I clearly saw quite thick exhausts on the rim of the "lens." Mr. LEDUC. -- Did you see flames? Mr. FARNIER. -- Yes, they were of red purple color. When the machine disappeared, as the day dropped, these gleams reflected themselves on its polished wall, which explains why the other witnesses believed they saw a ball of fire. Mr. LEDUC. -- Until now, all the people who had seen "saucers" had heard no noise accompanying their evolutions. You seem to be the first to have perceived a whistling sound. Was it as strong as the whistling sound emitted by a jet? Mr. FARNIER. -- No. I see jet aircraft at Villaroche, where I often go, and above my home, because Jouy is within a few kilometers of the Voisin airport where jets of the Dijon air base land. At this time the whistling sound of an engine that workmen started in a nearby workshop is heard in Mr. Leduc's office. Mr. LEDUC. -- You are hearing a small engine with 100 kilos of push force, locked up fifty meters away. Was this also strong? Mr. FARNIER. -- Oh no! Not so powerful... I did not have the impression that this noise was caused by a motor or an engine, but rather by a turbine. Mr. LEDUC. -- I still remain skeptic. You say the craft stayed on the location. For how long? on the sides. Suddenly, it bent and it raised up almost vertically at an extraordinary speed, undoubtedly about several thousands of kilometers per hour. Mr. LEDUC. -- And it was not a jet airplane? Excuse-me for insisting. Mr. FARNIER. -- No, I already told you. I see jets everyday. What astonishes me, however, it is that the radar of Voisin did not perceive it. Mr. LEDUC. -- If the craft flew at supersonic speed, you should have heard the classic sonic boom. Mr. FARNIER. -- Nothing of the sort. Only, on departure, the swish of the air penetrated by the craft. Mr. LEDUC. -- That's amazing! Mr. FARNIER. -- I know. I doubted what I saw, me too. I pinched myself to convince me that I was not dreaming. That lasted twenty minutes. I looked at my watch. Mr. LEDUC. -- Was the craft thick? Was it not a disk? Mr. FARNIER. -- It may have had two meters in its most important height. Mr. LEDUC. -- And you observed nothing else? Landing gear for example? Mr. FARNIER. -- I saw black features below the apparatus, but it turned too quickly for me to distinguish what they were exactly. Mr. LEDUC. -- In the current state of the technique, a machine such as that you describe to me is impossible to realize. I am building an avant-garde supersonic aircraft, the 022; well, it could not remain motionless like that for twenty minutes and gain in a few seconds the acceleration which you give credence to this machine. In any case, it cannot be a French apparatus. Mr. FARNIER. -- Certainly it could not. Mr. LEDUC. -- You distinguished no life signs inside? Mr. FARNIER. -- It seemed me that I saw that the interior of the machine was lit, but I can affirm nothing because of its constant rotation. Mr. LEDUC. -- But if this apparatus was so smooth, how could you see it rotating on itself? Mr. FARNIER. -- Because of the exhausts which made like a halation around it. Mr. LEDUC. -- I see that you are informed. You know about modern airplanes. Mr. FARNIER. -- I'm an aviation old-timer. Mr. LEDUC. -- Yet I do not see how a craft of this type, propelled by thermal energy, could travel long distances. If it is admitted that it was manufactured abroad, in U.R.S.S. or in the U.S.A., for example, it would need one frightening quantity of fuel. Mr. FARNIER. -- What if we did not know about its fuel? If it was of atomic origin? Mr. LEDUC. -- Atomic energy is not yet sufficiently under control to allow the functionning an engine at pilot's will. I know that there is the "Nautilus", the american atomic submarine, but to my knowledge one cannot reach an air speed as high as that which seems to be the prerogative of the "saucers". Instead of the 10.000 calories necessary per kilo of fuel, one would need 100.000 of them. By the way, was there at any time a of more important emission of flames? Mr. FARNIER. -- Yes, when the craft flew away, but only a little more. Mr. LEDUC. -- when the craft disappeared, did you hear any noise? Mr. FARNIER. -- No. And when it flew above Jouy, at an altitude of 2000 meters, the witnesses did not hear anything either. Mr. LEDUC. -- That is astonishing. When the apparatus was above you, are you certain that it was not more than 300 or 400 meters high? Mr. FARNIER. -- Yes, because I measured it up against a tree? I am used to to measuring angles quickly. Mr. LEDUC. -- I think that the official services should investigate on this problem. Mr. FARNIER. -- Maybe it is a new weapon. Mr. LEDUC. -- In this case, why take the risk to fly such a machine above a foreign country at the risk of a crash. All mechanical apparatuses have troubles. How to explain that one would send such an exceptional machine "to trott in country". The known apparatuses consume much. for example the "Comet"  carries 40% of its weight. The apparatus which carried the most fuel was the "Messerschmitt 163"  with 50%. By admitting that the machine that you saw weighs two tons, there would thus be a ton of fuel in its tanks. But with a ton of fuel one does not go far. Then there is no funny business remaining in one location for twenty minutes to waste energy. Mr. LEDUC. -- Do you believe that a foreign power which would have this fuel would send the machine which uses it to fly over the other nations at the risk of an accident which would allow to discover its secret? There is another thing: the heating of the metal, caused by the heating of the air on the wall (At 4000 km-hour, for example, the temperature would be of 600°C.) How could the passengers live inside a light fuselage? Mr. FARNIER. -- Maybe it is possible to isolate them. Mr. LEDUC. -- I believe you, but I am trying to understand. Mr. FARNIER. -- You can believe me. Mr. LEDUC. -- You said that you saw the machine hovering. Wouldn't it be a propeller, which by turning at high speed, would have given the impression of a disc to you? Mr. FARNIER. -- No. It was solid as a large lens. Mr. LEDUC. -- Another thing: on lift; if you make a craft of this shape rotate, it falls down. Mr. FARNIER. -- But perhaps it is precisely because it rotates that it does not fall. Mr. LEDUC. -- No, because if it remains on the spot it must fatally fall, unless there is an aspiration by the top, that you would not have noticed. [Captioned drawing:] The rocket plane engineered by engineer Leduc. Mr. FARNIER. -- Possibly, because I was placed below the apparatus and I saw his top part only at the end, when it bent to fly away, therefore not long enough. Mr. LEDUC. -- It is a pity that "flying saucers" always appear in the countryside. One never saw any above Paris, as you saw one in Jouy. If one saw a saucer at 300 meters above the capital, that would cause at least an intervention at the French Congress. Mr. FARNIER. -- They were not seen in Paris, but above Melun. The same day as me. Moreover I am not alone in Jouy to have seen this machine. It was debated at the city council, which prompted me to come forward. I know that there was, not far from me, country-women who saw it, they said that it was a sign of the end the world. Mr. LEDUC. -- If I had seen what you saw, I would not like to be laughed at. I must acknowledged that you puzzled me, but I persist in thinking that the human hand cannot yet build such amazing machines. In the meantime, the Press announces that this may have been a phenomenon of ionization, which would produce an optical illusion. However, with regard to the apparatus that I really saw, there is no hallucination, nor any possible doubt, it was really a metal apparatus evolving and humming above me. However, the problem is certainly the following. It is a new modern weapon most probably planetary and which for the moment one does not want it to be revealed to the general public. In my opinion, it is a machine for scientific research in peace time, which would explain its successive overflights of a currently prospected area, but which in the event of war would become a terrible new weapon. L = 400 000 x 10 = 4 milion kilometers. "I initially perceived a whistling sound similar to that of a jet but much weaker, then at 300 or 400 m above me, I saw an apparatus in the shape of a lens from 8 to 10 m in diameter and 2 m thickness. It was gray, shining like aluminum and released red and purple flames. The machine remained motionless during 20 minutes while turning on itself at a rate of 300 rpm approximately. Suddenly, it bent and flew off vertically at an extraordinary speed of several thousands of kilometers per hour, without making a sonic boom! I then distinguished the presence of port-holes and a 50 centimeters cupola." "I saw passing above my property, in Jouy-su-Morin, a large disc from 8 to 10 m in diameter, rotating on the spot and letting escape red-purple gleams, with a whistling sound a bit like the arrival of a jet plane. The craft was at approximately 400 m un height and hovered more than twenty minutes above me. I thus had the time to examine it well. The craft then disappeared in the direction of Coulommiers." "Former commissaire at the Aero Club of France, having served in aviation, I was not the victim of an hallucination and this machine was not a sounding-balloon, but a circular thick wing hovering motionless and moving at very high speed while gradually taking height." Jacques Vallée indicate that it is a letter from the witness to a newspaper of Coulommiers. He then proposes to name this kind of object a "Farnier disc". The author notes that in 1955 was published "J'ai vu, de mes yeux vu, une vraie soucoupe volante", by Eugene Farnier. The authors indicate that on September 30, 1954 with Jouy-sur-Morin at 17:20, Eugene Farnier, former approved commissioner of the flying-club of France, former engineer of civil aeronautics, claims to have observed during about twenty minutes a machine of lenticular form at 300 or 400 meters above the locality "Les Cailles". The craft let escape flames of color red-purple and the witness heard a whistling sound when it rotated. The authors note that according to Gérard Lebat the case was a hoax. The author indicates that on September 30, 1954, Eugene Farnier, in his property of the Seine-et-Marne, observed a disc of metallic aspect in lift 20 minutes, rotation, with a weak whistling sound, 10 by 2 meters, with flames by lower openings. The Belgian ufologist indicates that in 1954, on September 30, in France, in Jouy sur Morin - Grand Morin (the Seine et Marne) "Eugene Farnier was at 17. 20 in its vines at the localitys 'Gailles' when he heard a whistling sound like jet but much weaker. At 300 or 400 m an object of aluminium aspect moved. At its periphery there were red-purple exhausts, it had ten meters in diameter and a cockpit curvature with at its base four port-holes. The machine remained 20 minutes on the spot and going down slightly. Suddenly it tilted, presenting black features on its bottom, went up vertically while emitting more luminosity and disappeared." She indicates that the source is "Jimmy GUIEU: Black-out sur les S.V.' - FLEUVE NOIR 1956 - p. 163". 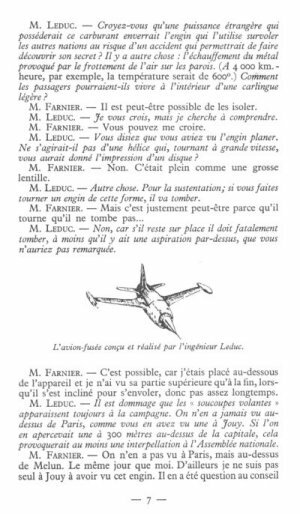 17:20 Eugene Farnier 6 walks his dog in Jouy-sur-Marin, when he attends a spectacle which astounds him: I initially perceived a whistling sound similar to that of a jet but much weaker then, at 300 or 400 m above me, I saw an apparatus in the shape of a lens from 8 to 10 m in diameter and 2 m in thickness. It was gray, shining like aluminium and released red and violet flames. The machine remained on the spot during 20 mn while rotating at 300 tours/mn approximately. Suddenly, it titled and climbed vertically at an extraordinary speed of several tousands of km/h — without making a sonic boom! I then distinguished the presence of port-holes and a cupola of 50 cm. Luc Chastan indicates that in the Seine et Marne in Jouy sur Morin, on September 30, 1954, "Eugene Farnier (one of the first plane pilots in 1907; he gave piloting lessons to Guynemer and devoted all his life to aviation) walks his dog, when he attends a display which astounds him: "I firts perceived a whistling sound similar to that of a jet but much weaker then, at 300 or 400 m above me, I saw an apparatus in the shape of a lens from 8 to 10 m in diameter and 2 m in thickness. It was gray, shining like aluminium and released red and violets flames. The craft remained on the spot during 20 mn while rotating at 300 tours/mn approximately. Suddenly, it tilted and climbed vertically at an extraordinary speed of several tousands of km/h, without making a sonic boom! I then distinguished the presence of port-holes and a cupola of 50 cm." Luc Chastan indicates that the source is "RR0 ** http://www.rr0.org". Eugene Farnier, pilot and planes manufacturer, member of the Company of the Civil Engineers of France (today CNIF) and commissioner at the Flying-club of France, was one of the pioneers of aviation. He was one of the first plane pilots in 1907. Eugene Farnier was especially the first commisioner of flying-club, and it is him who was in charge of granting a pilot licence, on July 15, 1910, in Roland Garros, and who gave its first piloting lessons to the future "ace" Guynemer. Wounded during an emergency landing in Etampes in 1910 (Paris-Pau race), Eugene Farnier was a then a military pilot during Worl War I, where he was to be again seriously wounded during an engagement with the enemy. In 1922, he founded a price to encourage gliding, he was a also a plane manufacturer in the inter-war period. Retired after Worl War II on the community of Jouy-on-Morin, it is there at the age of 75, that on September 30, 1954, he testifies to have seen a UFO on the territory of the community, above the Way of Gailles. 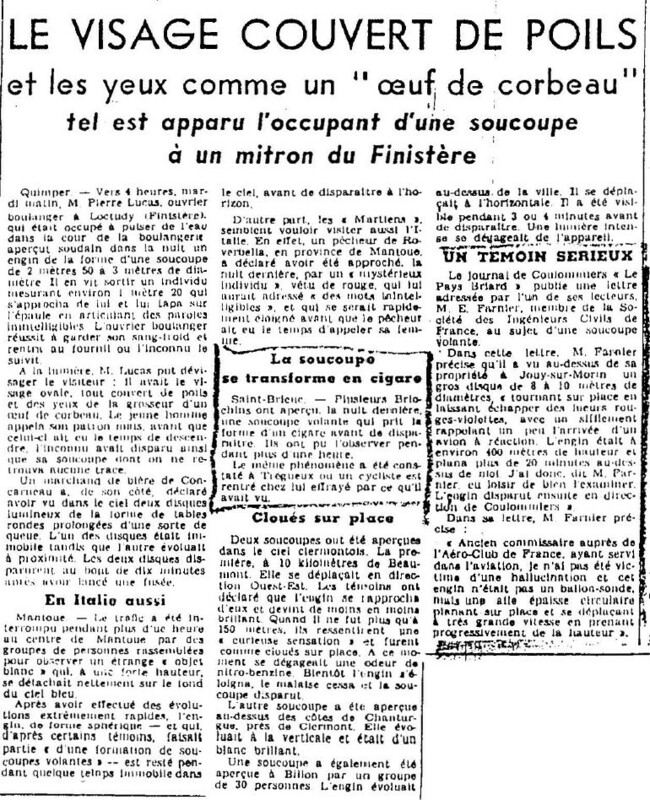 While the affair is only only one of many testimonys of what is called "the French flap" of 1954 of UFO sightings, the affair was publicized by many medias of the time, because of the personality and of the aeronautics CV of the witness: daily newspaper Le Quotidien de la Haute-Loire (October 8, 1954), daily newspaper Le Courrier de l'Ouest (October 19, 1954), weekly France-Dimanche (October 17, 1954), Radio Luxembourg (future RTL, October 23, 1954) and the RTF (Television, October 24, 1954). The source for the UFO story is noted as "Page devoted to 'the Farnier affair' on a website of ufollogy cataloguing", with a link pointing to my page. Testimony of U.F.O. on September 30, 1954: at the end of the afternoon of September 30, 1954, Eugene Farnier, member of the company of the civil engineers of France, says he had observed during 20 minutes a flying saucer above localities "Les Gailles." It is especially the personality of the observer, historical pioneer of French aviation retired in Jouy, which contributed to publicize at the time the affair with much interviews (in national daily newspapers, on the radio, and even during the meeting of the town council of Jouy-on-Morin). It is also socially to recontextualize [sic] within the framework of the "French flap" of 1954, who constitutes 2% of the statistics of UFO (or UAP) sightings listed in the world. 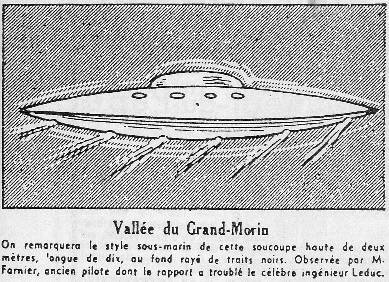 Headlining on the ufo topic only to stress this hoax, our newspaper angers one of the figures of pionneering aviation, Eugène Farnier*. The man, then aged 75 but still very "alert", as the magazine of the time put it, lives in Jouy-sur-Morin and, by mail, informs or director of extraordinary events he personally witnessed: "At about 5:20, on the evening (of September 30, 1954 thus, editor's note), being on my estate called "Les Gailles", in Jouy-sur-Morin, my attention was attracted by a whistling sound resembling a bit the arrival of a jet plane. And a few seconds later, exactly above me, I saw a big disc of 8 to 10 meters in diameter turning on the spot while letting escape red-purple gleams. It was at about 400 meters in height no more, and this craft hoveredfor more than 20 minutes above me. I thus had the time to check it out well; then after that it disappeared in the direction of Coulommiers. I learned since then that it had been seen half an hour later near Melun (told by "L'Aurore"). I said nothing. What's the use of convincing skeptics." An the former pilot prevents in advance the accusations of hallucinations: "Former commissionner to the Aéro-club of France, having served in aviation, I was not the victim of an hallucination, and itwas not a sounding balloon, but exactly a thick circular wing hovering on the spt and then moving at a very high speed while gaining altitude. My son-in-law, polytechnician, told me that with friends, seen in the region of Grenoble, an dientical craft. This kind of craftthus really exists whatever those who did not see it are saying." And he added an angry post-scriptum against our director: "Be sure that after the Press campaign doubting the reality of the flying saucers, witness will remain silent for fear of being ridiculed." "Such a craft is impossible"
Later, Eugène Farnier will tell his adventure on the airwaves of Radio Luxembourg and a small booklet will be published to transcript his interview by the engineer René Leduc, then builder of a very promising rocket plane. In this document, some additional information is published: th craft is said to have been "brillant grey as if it was built in aluminum" and it was probably inhabited, "It seemed to me that I saw the inside of the craft lighted, but I cannot be affirmative because of its constqnt rotation." Mr. Farnier, with his experience, thought of a "new weapon", but his interviewer, René Leduc, did not believe in this: "In the current state of the technique, a craft such as the one you describe to meis impossible to build." * Member of the Society of Civilian Engineers of France, former commissionner of the Aéro-club of France, having served in aviation during the Great War, first instructor of Guynemer and examiner who made Roland Garros pass his certificate. 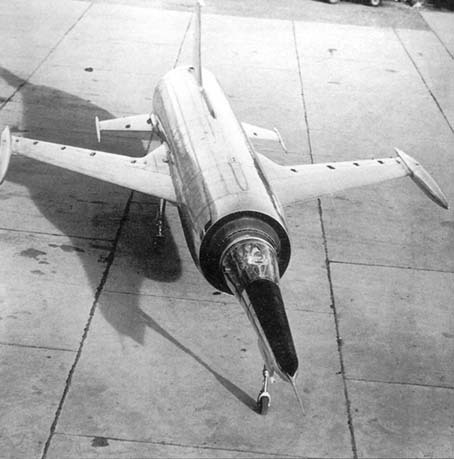 The 022 by Leduc, (picture above) like the majority of his other prototypes, was not at all a rocket-plane but a ramjet plane. Fast but of limited autonomy, these French projects were abandoned because of the budgets necessary for the war in Algeria and owing to the fact that turbojet soon ensured similar performances with a more important autonomy. This Comet is an English civil airliner of the time, the first to use jet propulsion. Messerschmitt Me 163 Komet was a little used German WWII rocket-plane. Leduc gives it in example because its flight autonomy was very short. Not looked for yet. Hoax. [---] Article in the national weekly newspaper France-Dimanche, Paris, France, October 17, 1954. [co1] Article in the regional newspaper Le Courrier de l'Ouest, France, October 19, 1954. [---] Radio intervention on Radio Luxembourg, October 23, 1954. [---] TV intervention on RTF, October 24, 1954. 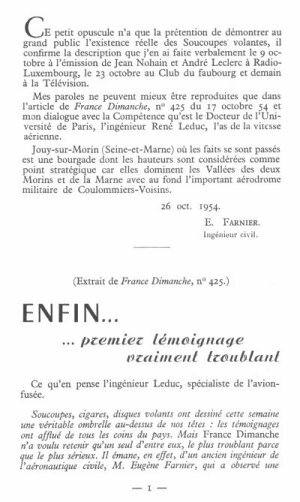 [fd1] Article in the national weekly newspaper France-Dimanche, France, October 24, 1954. 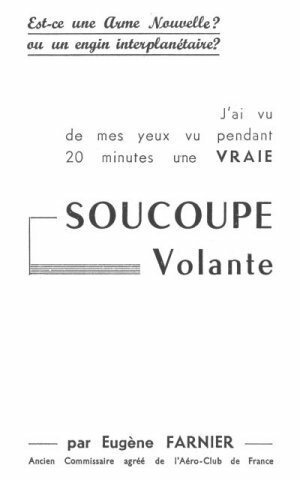 [ef1] "J'Ai Vu... Une Vraie Soucoupe Volante", 8 pages booklet by Eugène Farnier, self published, 1954. [ef1] "Est-ce une arme nouvelle? ou un engin interplanétaire? J'ai vu de mes yeux vu pendant 20 minutes une vraie soucoupe volante...", booklet by Eugène Farnier, Brodard et Turpin publishers, France, 1954. [---] Article in La Revue de Paris, Bureau de la Revue de Paris publisher, France, page 109, 1955. [jg1] "Black-Out Sur Les Soucoupes Volantes", book by Jimmy Guieu, Fleuve Noir publisher, France, chapter 6, 1956. [---] "El Problema Cientifico de los OVNI", book by Oscar Adolfo Uriondo, Plus Ultra publisher, page 168, 1968. [hd1] "Le Livre Noir des Soucoupes Volantes", book by "Henri Durrant", Robert Laffont publisher, France, page 121, 1970. [jg1] "Black-Out Sur Les Soucoupes Volantes", book by Jimmy Guieu, Omnium Littéraire publisher, France, chapter 6, 1972. [jv6] "Les Phénomènes Insolites de l'Espace", book by Jacques and Janine Vallée, Robert Laffont publisher, France, page 212, 1978. [pb1] "La 'vraie soucoupe' de Jouy-sur-Morin", article by Jean-Michel Rochet, in the regional newspaper Le Pays Briard, France, August 21, 2015. 1.0 Patrick Gross February 11, 2010 Conversion from HTML to XHTML Strict. First formal version. Additions [go1], [jb1], [lc1], [wi1], [wi2]. 1.1 Patrick Gross June 19, 2010 Additions [jv5], [jv6]. 1.2 Patrick Gross October 29, 2016 Additions [er1], [ub1]. 1.3 Patrick Gross January 9, 2017 Additions [hm1].